I haven’t dabbled in cobblers too much. In fact, this is somehow the first time I’ve ever posted a cobbler recipe on this site. What I have been doing for the past five years?! I think for a while I just assumed cobbler was similar enough to a crisp or crumble and never needed too much individual exploring, because crisps had already earned top spot on my favorite dessert list. And logically, that should have earned it a place on my list of things to try long ago. Finally, recently, I started seeing some swoon-worthy, beautiful fruit-filled cobbler recipes floating around the internet. Totally intruiged by the more biscuit-y, cakey top – way more unlike a crisp than I had realized – I set out to create my own perfect (and healthier) cobbler topping. Playing around with a mix of almond flour, tapioca flour, and baking powder for a bit of fluffiness, I created a pretty bomb (if I do say so myself) cobbler topping. Even better? By using non-dairy milk and coconut oil, it’s kept totally gluten-free, grain-free, Paleo-friendly, and vegan. A bit of coconut sugar and a splash of vanilla extract are used for flavor. These ingredients create a thick batter, which tops off the filling: a combination of fresh blueberries and fresh blackberries. The berries are tossed with maple syrup, tapioca flour, and cinnamon. The simple approach to the filling creates a lightly sweetened berry filling with a thick sauce and fresh flavor. The entire cobbler recipe can baked in a small baking dish, but I recommend splitting it up into three or four small ramekins and baking the cobblers individually. By dividing up the filling and batter, everyone can devour their own cobbler and enjoy the perfect filling to cobbler topping ratio. The blueberries and blackberries work together super well. The blueberries are high in pectin and break down a lot, providing thickness and sweetness, while the blackberries add a burst of tartness. The batter on top puffs up in the oven, becoming a fluffy, biscuit-y top with a crunchy crust made from a sprinkle of coconut sugar and cinnamon right on top. Preheat the oven to 350°F. Prepare a small baking dish or three small ramekins by greasing with a bit of coconut oil and setting on a baking sheet. In a bowl, combine the blackberries, blueberries, maple syrup, tapioca flour, and cinnamon. Stir to combine. Pour the fruit into the prepared pans, dividing evenly if using more than one ramekin. In a different bowl, combine the almond flour, tapioca flour, baking powder, coconut oil, non-dairy milk, vanilla, and 1 tablespoon coconut sugar. Mix until smooth and then dollop over the berry mixture. Combine the remaining tablespoon coconut sugar with the cinnamon and sprinkle over the batter. Bake for 25 - 35 minutes until a toothpick inserted into the pastry comes out clean. Serve with dairy-free ice cream! I love cobblers, but have never posted a recipe on my site either! Go figure! This version is just gorgeous, Rachel! I’m in love with the pretty colors. 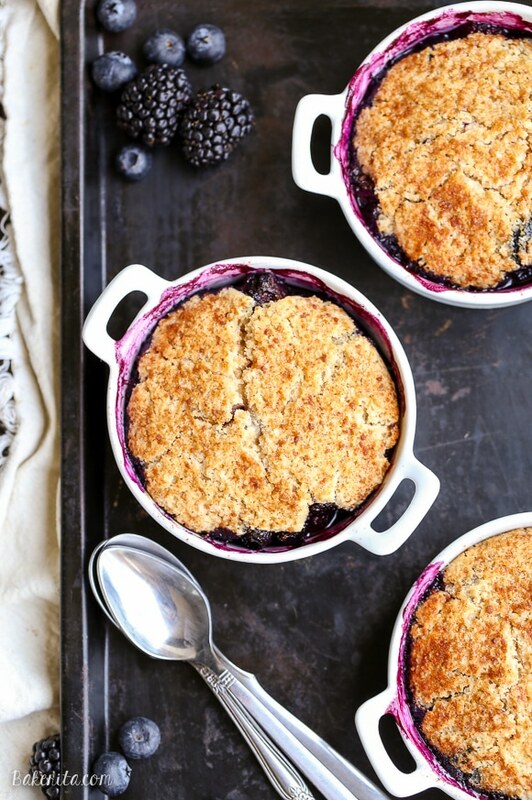 Blackberries and blueberries make the perfect combo. And that topping looks SO good! Love this summery dish! You’re reminding me that it’s been basically FOREVER since I last had a good cobbler! Rachel, this is simply STUNNING! You make those berries look SO dang gorgeous. This is Friday food aaaaaaaall the way and I need it! Our new farm has an entire fence row covered in blackberry bushes!!! They are just starting to come in so I know I will be making this all summer long!! I admit that crisps are my go-to and that I haven’t messed around with cobblers much either. 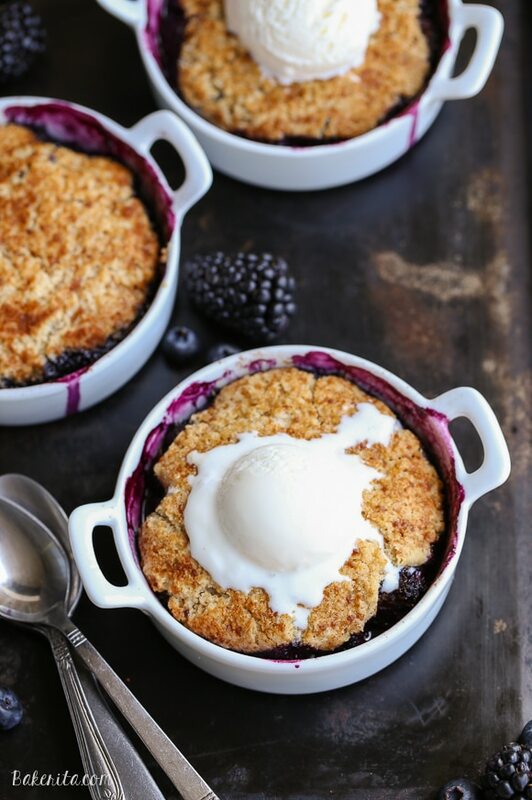 This cobbler looks perfect with that topping that looks so tender, and the blackberry-blueberry combination sounds delicious! 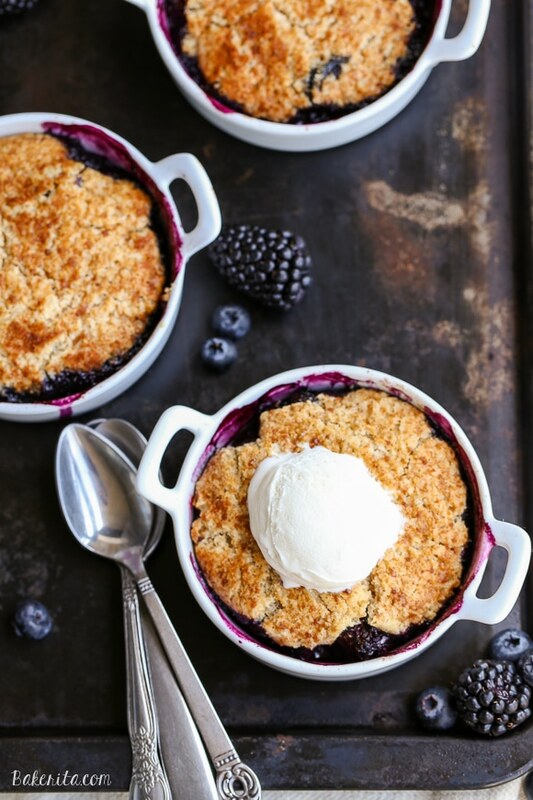 It has been a long time since I have made a cobbler, and love the blackberries and blueberries together. This looks superb!! 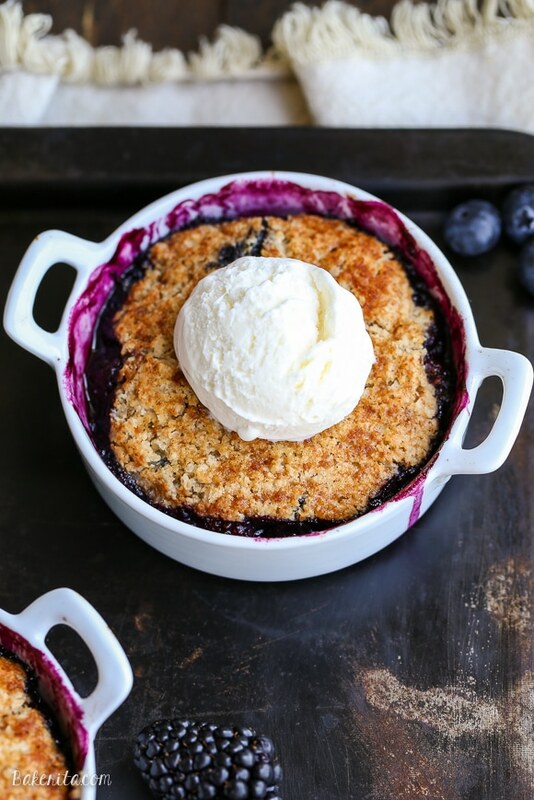 I love a good crust too on my fruit crips/cobblers and this sure looks amazing!! Have a great weekend friend! What a fabulous looking cobbler Rachel! Glad you jumped in and tried one. Cobblers are always so easy and the perfect summer dessert. Or breakfast maybe?! Can’t wait to try your version. I would love to try this one but we are in winter here in Australia. Do you think it would work with frozen berries? Thanks, Trish! You could definitely use frozen berries. Enjoy! I can never resist crisps either but cobblers are another weakness of mine. These are beautiful, Rachel! I love that it’s gluten free and vegan and the blackberry and blueberry combo is totally making my mouth water! Cobblers are so fun this time of year! I love fresh berries and these look so pretty and delicious! Also, I love that you made them single serving! SO fun! Hope that you’re having a great weekend! Delicious, I’ve actually never had cobbler. I too thought it was similar to a crisp or something. The photos are GORGEOUS! Love how rich blueberries are in color. Oh gosh, these cobblers look AMAZING! That GF topping is calling my name! This was absolutely delish. My husband and I both loved it. Next time, we will cut way back on the cinnamon … or else eliminate it all together. Thanks for an awesome recipe. So glad you liked it, Kiki! Cinnamon is definitely personal preference, so adjust as necessary to suit your tastes :) thanks for your feedback! This cobbler was pretty awful. The pastry sank down into the blackberries and when cooked was gooey and grey and looked very unappetizing, even though I cooked it an extra 10 min. The blackberry mixture was not sweet enough. So sorry you had trouble, MG! Wish I could help diagnose what went wrong – the pastry should have maintained it’s thickness on top of the berries. Sweetness can definitely vary based on blueberries, so if your berries were tart that could’ve been why you didn’t find it sweet enough. Hi Rachel, I don’t know if I’ve commented before. It’s not easy to find a grain-free dough recipe without eggs… thank you so much for this. Made it with nectarines, plums from my tree, and wild frozen blueberries to fill up the dish. So delicious! My hubs and I are eating super clean and paleo-ish these days, so this was a lovely treat for the 4th of July weekend. Hi Stephanie, thanks so much for your comment and feedback. I’m so glad you enjoyed the cobbler – the fruits you used in the filling sound so delicious. Jealous of your plum tree! I just made two cobbler recipes with blackberries. Both were good! However, I must say that this one was the best! Loved the sweetness and cinnamon flavor added a “wow” factor for me. Thanks for sharing! I’m excited to try this cobbler!! It just came out of the oven. I made it with fresh marionberries!! One question? Can this recipe be doubled to make it for guests? Hi Kristy, hope you love it! Jealous of your marionberries – I can’t find them down here in San Diego. You can definitely double the recipe, just increase the pan size (if you’re baking in one pan) and bake for a little bit longer. Enjoy! This is my favourite desert of all time, can’t wait to try your recipe over the weekend! Awesome!! I hope you love it Robbie. I’m going to try this also do you mind me asking where the mini dishes are from that are in the photo? I believe I got them at Daiso! I made this cobbler just as printed, only I used frozen berry mix. I took it as a dessert for our friends and they loved it! I grew up with cobblers and crisps and all the recipes I had used white flour so I am so thankful to have found this recipe! Would the topping work if I substituted arrowroot or cornstarch for the tapioca flour? Picked the blackberries from our farm fence line. 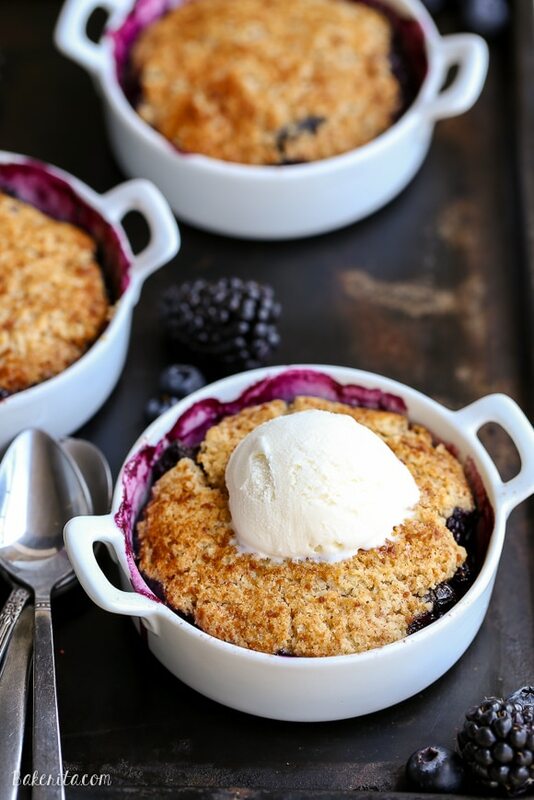 This is the best recipe for black and blueberry cobbler, thanks! My husband couldn’t wait until after dinner – dessert first!!!! Amazing, so jealous of your blackberry bushes! Doesn’t get much fresher :) so glad you guys enjoyed it!! I made this for company without trying it first. It was enjoyed by everyone. I am making it tonight for the 2nd time for guests. We live in the Pacific Northwest so blackberries are abundant. The blueberry addition was a great combination. Thanks for a great recipe for dessert that is not loaded with sugar and fat but very tasty. So thrilled that you and your guests loved this recipe, Cherie! Thank you so much for sharing your feedback with me. Lucky you to have so many fresh blackberries around – I miss that from when I lived up there! !